Tropic Pure Plant Skin Care is a natural brand which I have known for a few years, long before I had a blog. It has changed a lot since I first used it but products never fail to impress me. The range continues to grow and recently two Organic Luxury Oils have been added to the collection. I have been sent the White Frangipani & Magnolia to review. The first thing that catches your attention is the elegant glass bottle. The silver tear drop at the top unscrews to allow you to pour the liquid. The ingredients are some of my favourite oils – coconut, rosehip, jojoba and macadamia. What is great about this product is that it is versatile. Use it as a body moisturiser, massage oil, bath oil, nail & cuticle or hair treatment. The oil is solid at room temperature you need to warm the bottle in warm water to transform it to liquid. Any Elemis fans reading this will probably be thinking of the similarity with Frangipani Moisture Melt. This is not a quick fix product you need to set aside some time for a pampering session. Have the bottle in the sink whilst taking a shower or float it in the bath so it is ready to use when you have relaxed. It is a beautiful silky oil which sinks into my skin with ease (I am dry like the Sahara). If you are familiar with Frangipani you will know it is a heavy and exotic aroma. However, if you are not a fan of this feminine floral then maybe try the Bergamot, Lime & Neroli. Overall, it’s a beautiful product and perfect for anyone who likes a home spa treatment. 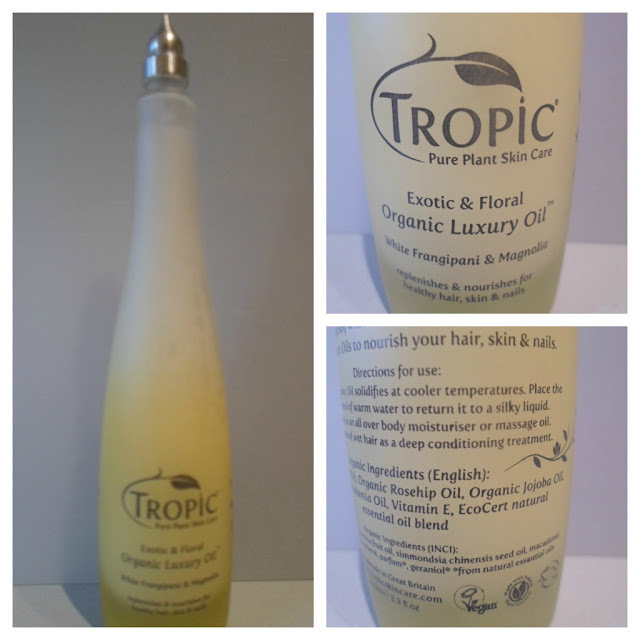 The Luxury Oils retail for £25 (100ml) and can be purchased directly from Tropic’s website. Tropic products are natural, vegan and cruelty free. Some of Tropic's products do contain phenoxyethanol and if this concerns you then the website does detail full ingredients. If you would like to read my other Tropic reviews click these links - cleanser, moisturiser, toner and polishing mask. I haven't tried the Elemis but I think they sound familiar from what I have read. I'm sure you will like it.